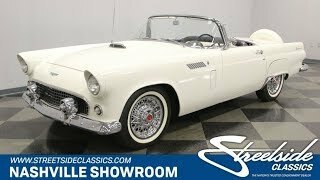 Hi, I am interested in your 1956 Ford Thunderbird (stock #1313-NSH) listed on Autotrader for $39,995. I'd like to get more information about this vehicle and confirm its availability. Find yourself a twisty winding road to nowhere and enjoy some sun on your face and wind in your hair. Then maybe head home, drop the Opera Window hardtop on, dress up in your Sunday finest and hand the keys to a lucky valet as you head into dinner or a show. You will definitely attract attention as you roll through town or pull up somewhere in this car. Everyone knows what kind of car it is immediately. This one is dressed up in a fresh coat of the factory original Colonial White with shiny chrome which hangs like jewelry on the car. The scoop on the hood is edged in it and below the Thunderbird that leads the way up front is an eggcrate grill underlined by a substantial chrome bumper. Headlights are perched high on the fenders with body colored trim shrouding them. From there a smooth body line runs along the top of the door to the subtle tailfins and the taillights. Fender skirts trimmed in chrome add a touch of class and Thunderbird is lettered on the top of the fender. Of course, the continental spare tire mounted on the trunk is a dramatic feature and when you drop the hardtop on with the chrome trimmed Opera window, the look is just stunning! Open the door, or just take a peek inside if the black convertible roof is down, and you will find a gorgeous interior in its factory original White with Black trim. The door panel sets the pattern with a black top edge and a long black armrest set on a horizontal patterned white panel. That pattern in white is carried through on the seats which are trimmed in black and invite you in to have a seat and take a drive. A three-spoke steering wheel has a chrome horn ring running most of the way around it. The dash board has a central mounted speedometer with fuel and temp gauges below it while the tachometer and a clock flank it in their own round pods on either side. A machine turned panel runs across the center of the dash and contains the control knobs for the lights and ventilation system and an FM/Cassette player added for your listening pleasure is the only non-stock item in the car. Raise the hood and you will find a 312 cubic inch motor which has been properly restored and is nestled down in a neat and clean engine bay. This engine was a nice feature introduced on the 56 year-model cars that produced more horsepower. Coupled with the 3-speed automatic transmission and the new 12-volt electrical system, it started easier, had better lighting and visibility for night driving, and made for a great driving experience. A polished air cleaner gathers up air from the hood scoop and feeds it to the stock carb, intake and cylinder heads. Those heads are topped by beautiful finned aluminum valve covers with a Thunderbird embossed into them. The chassis received a fresh set of shocks both front and rear as well as new sway bar links and bushings. The car rides on 205/75R15 white wall tires all around mounted on real chrome wire wheels that are absolutely gorgeous. Come on down and check out this beautiful classic. Its just waiting for someone like you to come take it for a ride.